About two weeks ago I received an email from a readers about an author she had recently met and a book recommendation that she had for me. So of course, I wound up in a bookstore not long after that, taking her up on her suggestion. I asked if she would be willing to write a guest post about it and she agreed. Her timing is perfect because I just finished the book last night, and also found it enjoyable. So thank you to “Navajo Keti” for the review! 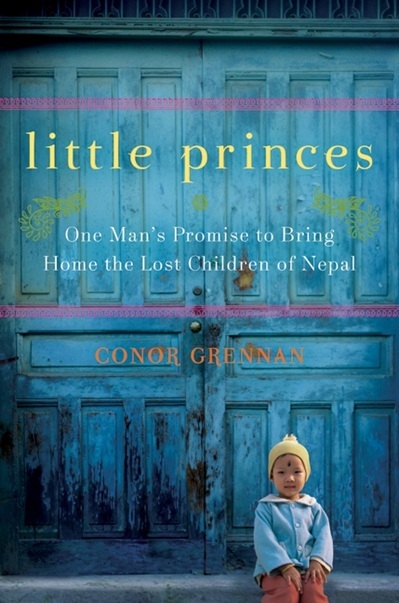 Like “C” I am one to stop all traffic when I find something related to Nepal, so I thought “oh lucky day” when I came across a meet and greet with author of Little Princes- One Man’s Promise to Bring Home the Lost Children of Nepal by Connor Grennan. I was excited not only because this was related to Nepal, but this summer I’m planning my first trip to KTM on a volunteering trip in an orphanage. The book follows Grennan’s initial plan to travel around the world, where volunteering at Little Princes Orphanage was intended to be a pit stop in his one year trek around the world. But at the end of his yearlong excursion despite load shedding, lack of plumbing, and more than enough dal bhat (which he describes with such humor) he is hooked; to Nepal and the smiling faces of Little Princes. The story follows Grennan’s discovery that the children of Little Princes are not orphans but victims of Nepal’s civil war. Grennan not only changes his career plans but ends up starting a NPO- Next Generation Nepal where he treks to the most undeveloped parts of Nepal to reconnect the children with their begotten parents. I’ll admit this book had my mind pondering for a while, mostly because by the time you finish the book, YOU feel like you have established a connection with the children. Grennan’s coming of age story is beautiful and makes me anticipate my May 15 departure even more. I told them the truth. I told them I loved Nepal, I loved spending time with them and living here in the village. But I had to go home, and I would likely not be able to make it back for a few years, when they were all much bigger. I had to start a new career. I was completely broke, and I had to buy food and rent a home. “And get married, yes, Brother?” said Santosh, smiling. “Uh — yeah. Well, no — not really, to be honest. I think you will be married before me, Santosh,” I said, happy that the children took this as a joke. Then the children started with a chorus of “What about me, Brother? You will be married before me?” and I had to go through the whole list of children, all the way down to assuring Raju that yes, even he would probably be married before me. 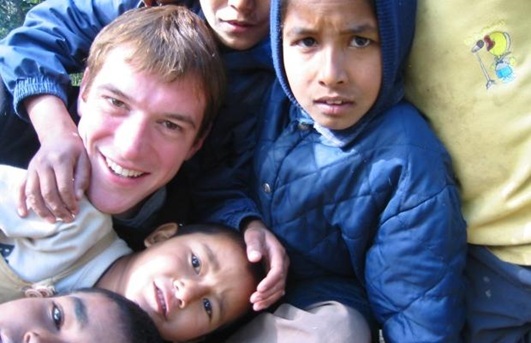 If you want to hear more from Conor Grennan you can view the following videos and if you want to learn more about his organization Next Generation Nepal click HERE. P has been very supportive of my writing, and I think he is as excited as I am that people are enjoying the blog. He doesn’t consider himself a “writer” but felt passionately enough about a football match recently (the Ireland v. France World Cup qualifier on Wednesday) that he actually asked me if he could write a guest post. So although it is off topic (though P argues that it is not “off topic” since he loves football, and thus it is “part of our household”), I hope you enjoy P’s take on the game and his very first (ever!) blog posting. To Henry’s admittance of handball and his sly act to pass the blame to the ref, Richard Williams of the guardian writes, “No, mon brave, but you are the captain of France, the country that gave us the World Cup, and here you had the chance to show us what sport can mean – or, at least, what we tell our children it means.” Not to mention that the French also gave us existentialism and Albert Camus who surely knew about morality and the duty of man as bravery and fair play, something that he learned and valued during his goalkeeping stint for RUA (Racing Universitaire Algerois). I think Henry had been a role model (this has been also debated lately) up to now with his reputation both on the field and more importantly off the field where he has actively led the anti-racist campaign, UNICEF, and the Joga Bonito (play beautiful) ad campaigns. Henry could have admitted to the ref at the 103rd minute and he would have hit the news headlines for a different reason. But he is human after all and the stakes were all too high. Most players would have probably done the same. The French public, the media, and former players have joined the legions of people who have lashed out at Henry to reveal their displeasure and embarrassment in the manner the victory has come. A major section of the French nation has turned against the former Highbury star. Clearly the French national team has been mismanaged which was evident from its lackluster play and is only thriving in the shadows of its past performances. The Irish were by far the better and more entertaining team. The fact of the matter is Ireland is out and France is through. FIFA will end up turning a deaf ear to the Irish pleas. The country will have to wait another agonizing four years to be able to resurrect their hopes of qualifying to the next World Cup. Should FIFA always try and give an easy passage to the top-seeded teams in the WC qualification playoffs and maintain the hegemony? Perhaps Portugal would have played France and Bosnia played Ireland had the seedings not been included at the last minute in the selection for playoff qualification. I would not mind seeing Džeko instead of Gallas or Anelka. One can only hope FIFA learns some valuable lessons with Ireland’s misfortune. Henry, already in the twilight of his career, will probably lose his revered status among a majority of his supporters and every game he participates in from now on will be fraught with criticism. Like Zidane’s moment of madness in the last World Cup when he headbutted Materazzi, this will be talked about for a while. Love it or hate it. This is football.